Pictured below is the previously published Horoscope of Modern Humanity with scribbles intact if you care to enlarge the image. Modern Humanity's 'birth' time is based on two cosmic factors: the exact moment of the Total Solar Eclipse of April 26, 1892 and the third of three Great Conjunctions of generational planets Neptune and Pluto. Solar Eclipses are not rare, of course, but the cycle of Neptune and Pluto is approximately 492 years in length. And it is rare that an eclipse occurred so close to a Great Conjunction of outer planets! The 1892 Total Solar Eclipse @7Tau05 suggests the greed embedded within humanity (Taurus is possessive, greedy, and intolerant on its worst days but it is a sign of Growth). In the chart, you see that the Neptune-Pluto conjunction (which perfected as near as can be told on April 30, 1892) occurred @7Gemini+ which conjoined US natal Uranus (July 4, 1776 Uranus @8Gem55 = freedom, independence, war and revolution!) and that gives us a midpoint picture worth considering (below) yet that isn't why I re-post this horoscope today. 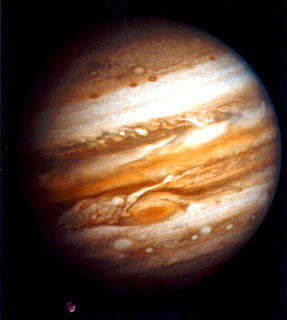 The reason for today's shout-out to Modern Humanity (for which the Great Cosmic Clock restarted during the oligarchic Robber Baron age of exploiters whose biological and ideological descendants continue to plunder the world as I type) is that the hugely Jupiterian-Uranian Mr. Trump has an interesting time link to the 1892 Neptune-Pluto conjunction--and he's something of a 'robber baron' himself with criminal associations of the mobster kind, elements that are also in the Underworld realms of Neptune-Pluto. Mr. Trump's Prenatal Eclipse (PE), which manifested on May 30, 1946 @8Gem48 in the 2 Old North series, is also his Syzygy Moon since it was the last lunation prior to his birth on June 14, 1946. His PE effects are strong and reveal a prevailing lunar influence which adds to his problematic Moon-South Node conjunction opposing his Sun-North Node conjunction. 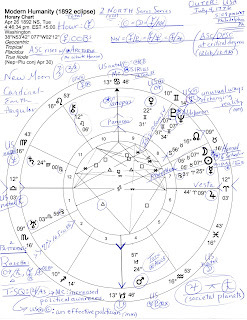 Yes, his relationships are definitely affected and separations may occur with 2 Old North--and separations may occur with disruptive Uranus, the planet that leads the pack in Mr. Trump's natal chart. And as you know, eclipses are called 'wild cards of the Universe' since their effects (if any!) are completely unpredictable. 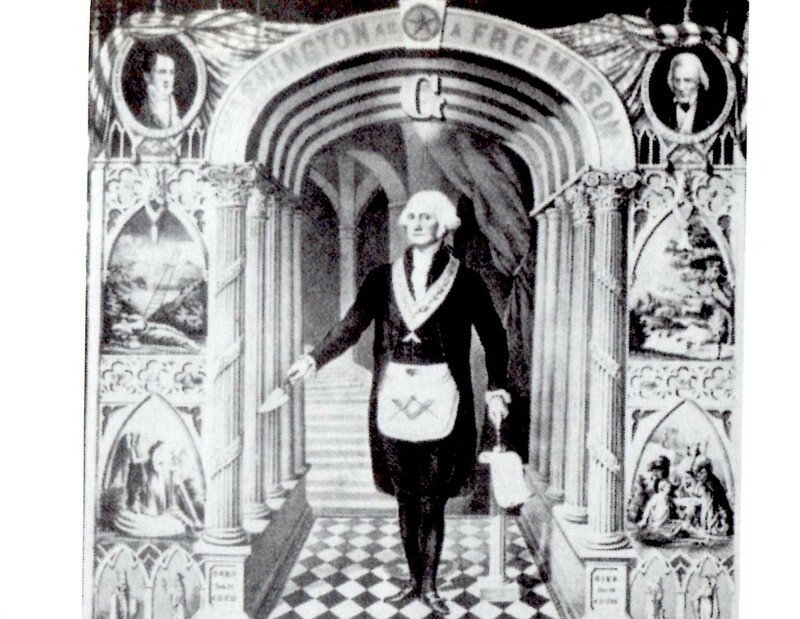 However, they do tend to uncover inconvenient secrets with fair regularity and we may depend upon their 'themes' to give us a hint of general trends 'running in the background' of society. Actually, the Uranian Tweeter IS a wild card in a very leaky White House! 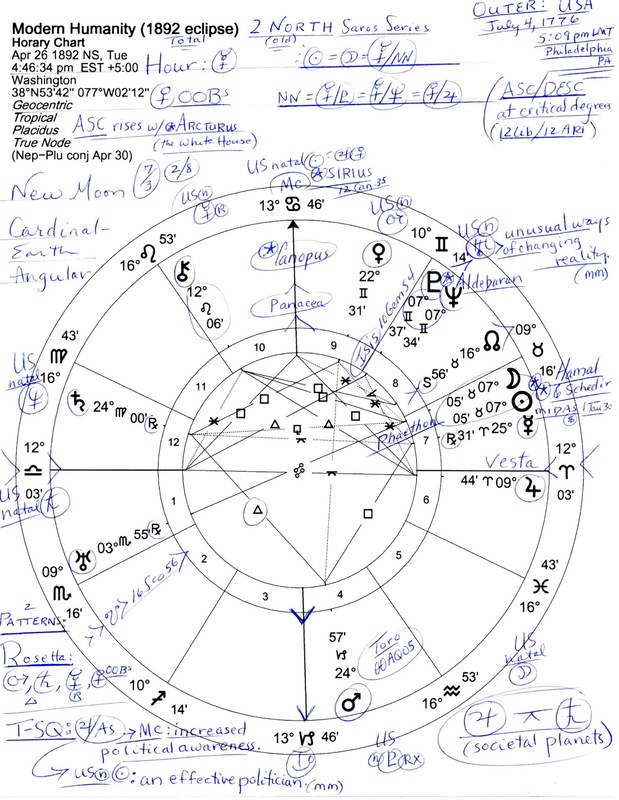 Plus, he has other time links to this chart such as evaluating Venus (venal and retaliatory at times) which loves luxury (like gilded NY apartments), and @22Gemini in 1892, Venus falls into the midst of Mr. Trump's quirky Uranus-NN-Sun trio in his 10th house of Career and Public Status. 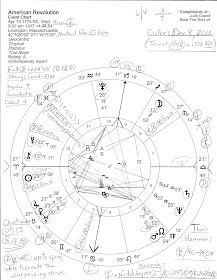 There are other time links between Trump's natal planets and the 1892 chart and I'm certain you can find them if you wish. Meanwhile, back in April of 1892, the Solar Eclipse @7Tau05 was also of the 2 Old North persuasion and my feeling is that 2 Old North themes of separation, ending of unions, rifts, schisms, and bad news concerning relationships describe the tendencies of Modern Humanity and are emphasized in 2017 with time links because someone thought putting Donald Trump in the White House (and all the other Trumps) was a great idea. Midpoint potentials for Neptune-Pluto = US natal Uranus (and Donald Trump's PE degree): impersonal attitudes toward destructive or antisocial activities; going to extremes with drugs (Munkasey) - and drug policies, Mr. Sessions? jc; possibly aberrant behavior; adventurous ego thrust; making waves to get to shore; disruption to gain recognition; courage (Tyl); peculiar discoveries (Ebertin). Further Reading: Astro-Notes on the Capulus of Donald Trump; Donald Trump's Natal Chart w/ Mike Pence's Planets; The Whimsical Sun (POTUS) of Inauguration 2017.